The crab has always been revered by gourmands as one of the sea’s most precious treasures. The perfect morsels of jade-white meat that is prized out of the shell needs little or no embellishment. With a little imagination and ingenuity, Chinese cooks can get more out of what precious little crab meat there is to make this luxurious ingredient go further on the festive table. Shaped like traditional Chinese coins, these Hai Choe dumplings are the perfect curtain-raiser for an auspicious Lunar New Year feast. Note: These Hai Choe dumplings can be made weeks ahead. After steaming the segmented rolls, let them cool down before wrapping them up in cling film or store in air-tight containers for freezing. Defrost the rolls when needed and deep-fry before serving. This recipe was first published in Flavours magazine. Boil pork for 15 minutes, then remove from boiling water and set aside to cool before dicing up meat. 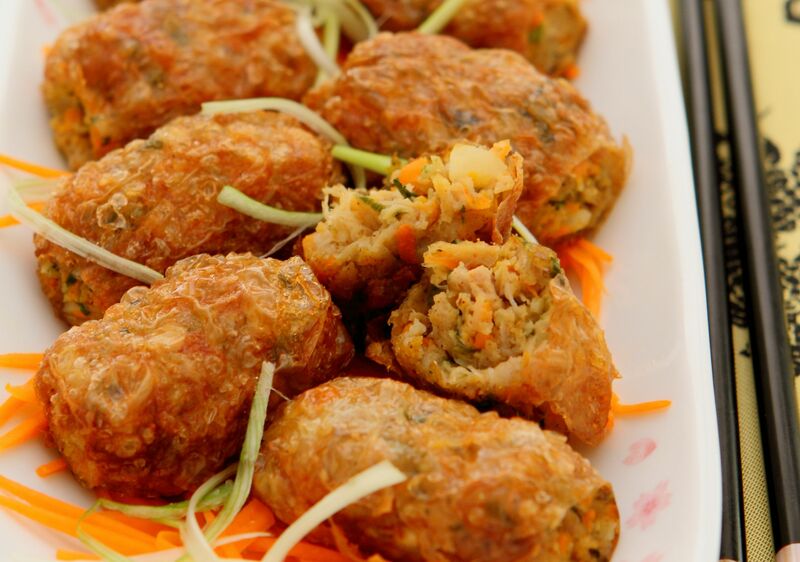 In a bowl, combine diced pork, fish paste, crabmeat, carrots, water chestnuts, spring onions. Chill the paste in the refrigerator for 1 hour. To prepare dumplings: Spread out a piece of beancurd sheet on a flat surface and moisten with a piece of clean damp cloth. Place spoonfuls of the crabmeat paste onto the damp sheet, leaving a space of 1” from all sides. Shape the paste into a long roll, fold the beancurd sheet over and roll it up. Tie up each end of the roll, 1” away from the ends of the beancurd sheet, with hemp strings. Secure each tie with a double knot. Use another piece of hemp string and tie the middle of the roll with a double knot, essentially dividing the roll into 2 sections. Be careful not to pull the string too tightly to prevent the beancurd skin from breaking. Repeat the tying process at the midpoint between the 2 sections. The crabmeat roll will now be divided into 4 segments measuring about 2” in length each. Do the same with paste until all beancurd sheets are used up. Place the tied-up rolls gently into a steamer and steam for 20 minutes. Allow the steamed rolls to cool down for about 1 hour to firm up texture. Once cooled, heat up oil in pan and deep-fry the tied crabmeat rolls till golden brown. Drain off excess oil, then snip off the hemp strings, cut the dumplings at the tied segments and serve hot.